Our Chainmail Anklet is made with 8 Siam Swarovski crystals on a delicate chain. Hand made to order. Our Antique Brass Anklet features Antique Brass chainmail jump rings and Gold Swarovski Crystals on an Antique brass chain. 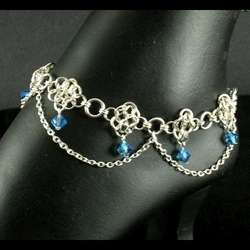 Our Chainmail Anklet with Blue Crystals features 8 Sapphire Blue Swarovski Crystals on a silver chain. This silver anklet features a quaternary or four point knot. It is said to represent concepts that exist in groups of four such as North, South, East and West. Our Celtic Triquetra Knot Silver Anklet features the Triquetra or Trinity knot. Symbolic of concepts in groups of three, this delicate anklet is crafted in sterling silver. Our Crystal Chainmail Anklet features a 4-1 European style. 8 Swarovski Crystals. Our Fantasy Dragon Silver Anklet adds a little charm to your day whether prominently displayed as a part of your warm weather attire, or for secret inspiration under your pants. Our Irish Claddagh Silver Anklet offers the sentiment, With my two hands I give you my heart and crown it with my loyalty.